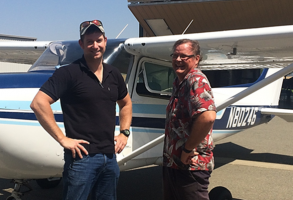 I want to let you know how much I enjoyed working with John to get my Private Pilot’s License. The accelerated program was the best use of my time and was very cost effective. John is an excellent instructor, very patient and always ready with tips to ace all PPL maneuvers. 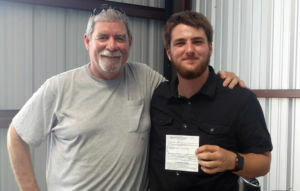 He gave my confidence a solid boost and ensured I was a safe and competent pilot before my checkride. Instead of wasting hours flying infrequently, I would recommend AFIT to one and all looking to get their pilot training completed in the best possible way! I couldn’t imagine learning aviation any other way than with AFIT. The highly accelerated program let me attain an incredible wealth of knowledge in the optimal and succinct amount of time. 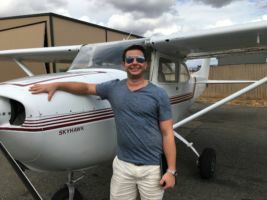 My instructor, Shawn, was the ideal teacher for me; his high experience (+9,000 hours), aggressively planned out routines, relatable personality to most all people and enthusiastic appreciation for aviation made my experience nothing short of desired. This man deserves heavy praise, no exaggeration there! Thank you endlessly for convincing me to take a chance with AFIT – my knowledge gained here will be forever with me. Working with Jason over my two weeks of flight training was a blast. Jason pushed me to excel and thoroughly prepared me for my check ride, which I just passed yesterday. He over-prepared me and the check ride went very smoothly (Jason’s standards were higher than the examiner’s). I’m ecstatic and feel like a confident and safe pilot. It was a demanding two weeks, but I couldn’t imagine learning how to fly any other way. It was a pleasure learning under Jason’s guidance and I appreciate all of the care he put into my training. 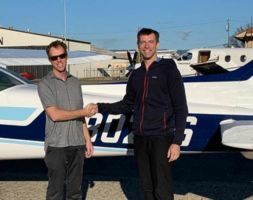 After my first solo, Jason took me flying in his aerobatic plane, which was a great experience and kept me motivated about the possibilities of aviation! I intend to work with AFIT again when I go after my IFR rating. 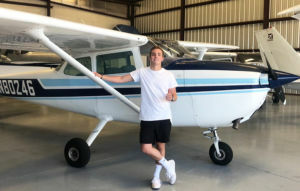 Thank you for your help in making my dream of becoming a private pilot come through. I want to specially thank you for recommending Tom for the job. What else would you ask for? Todd is and was truly awesome and I will forever be in his and your debt for all of the support. I had a great time getting my pilots license. Todd was a perfect fit for me and tailored the program to utilize my previous flying experience. I just got checked out to rent a high performance 172 at my local airport and can’t wait to get up in the air again. My experience with AFIT was nothing short of perfection. The two weeks flew by (pardon the pun). In all seriousness with Tony’s organization and John’s expert instruction gave me the tools to succeed. 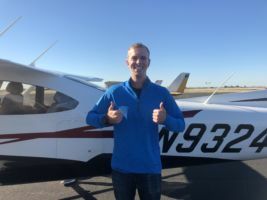 Getting a private pilot certificate in two weeks is not easy, but with John’s instruction it didn’t feel like work at all. I recommend AFIT to anyone who wants to earn their certificate quickly and the right way. Thanks for the email. Very prompt as usual, I should not expect anything else! Your 10-day finish up was exactly as promised. Todd is a real professional, very calm, good humored and knowledgeable. We hit it off great, but honestly I think Todd could get on with anyone. He sized up my experience quickly and focused on what we needed to work on. 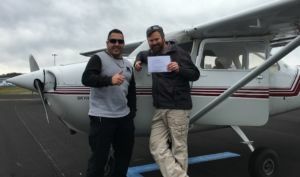 I soloed in 4 days and passed the check ride at the end of the finish up. Todd really knew when to push and when to call it quits for the day. He made what had previously been a frustrating learning experience really fun again. Rexburg is a good place to learn – plenty of new experience for me at altitude and 10 degrees cooler than Dallas! As to AFIT overall, you communication has always been prompt and accurate, again very professional. I could not be more impressed with the training I received through Accelerated Flight & Instrument Training. The curriculum, equipment, and quality of instruction completely surpassed any expectations that I had. I have to admit, I was a bit nervous at first.. as I had never received so much consecutive training in such a small amount of time. The moment training began, it immediately became clear that there was nothing to worry about. Daily ground and flight training was structured in a logical, intuitive, progression of skills which built upon each other. Mike was awesome well!! I learned more from him in 40 hours of training than I did in the 100+ hours of training I came in with. He is calm, clear, and extremely patient, though he’s not afraid to challenge you when you get too comfortable. He knows when to assert himself and make crucial info known, as well as when to keep the cockpit a sterile environment so you can acclimate to your setting. Repetition was key- I couldn’t imagine getting my instrument license in any other format. I will definitely be training with AFIT again in the near future! Tom did an outstanding job getting me prepared for my instrument check ride. He was willing to work with me and overcome multiple aircraft issues and weather days. He is extremely knowledgeable and an excellent instructor. I would recommend him to anyone wanting to further their education in aviation. Thanks for everything. It’s hard to believe how much can get done in as little as two weeks! If you had told me how much progress I would’ve made in such a short amount of time, I wouldn’t have believed you. But thanks to my time with Greg, I now can fly comfortably and confidently. He was always incredibly patient, understanding, and an all-around great and fun guy. We even brought my friend along and flew up to Tahoe after my first week! It’s hard to overstate how quickly and thoroughly the program trained me in such a short amount of time. I went from soloing a mere three traffic patterns to flying solo long distance cross country in a matter of days! AFIT has given me many great skills and memories as I set out to pursue more with my pilots license. 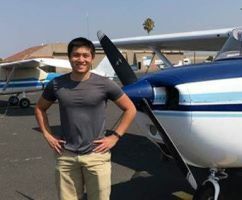 I couldn’t think of a better way to have kickstarted my future in aviation! After training back in May with AFIT to get my private pilots’ certificate, I turned back to them get my instrument rating. It was ten days well spent advancing my aviation career. This time I brought my own plane to the party and Mike was wonderful in teaching me how to get the most out of my very limited equipment. The aircraft I was training in only had a single VOR, no DME, and no stand by frequency in the nav. Mike helped me get her set up so that I could shoot VOR/LOC/ILS that requires multiple frequency changes. That’s what I love about training with AFIT, their instructors have plenty of hours under their belt and are excellent at bringing up techniques to make pilot workload lighter. Instrument training over the short period of time means that it is going to be a lot more intense, and it was. I made sure that I had my cross-country time and some hood time with a safety pilot (per the FARs you need 40 hours of hood time, but only 20 has to be with an instructor). Knocking as much of the training out of the way as possible before hand allowed me and Mike to spend more time focusing on my instrument flying instead of just building cross country time. If you have the opportunity to develop some flight skills before coming out, it will certainly make training a lot easier for you. 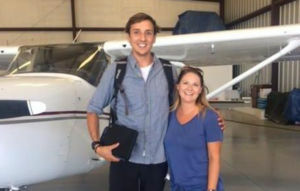 For people concerned about AFIT teaching you to pass the tests and having examiners that go easy on you, I had an individual from the FAA sit in on my check ride as part of their standard operating procedure to make sure that my examiner did her job correctly. He was more than happy with my performance and was pleasant to work with as well. At the end of the day I can say that because of my training with Mike that I am confident in my instrument flying abilities. As always, Tony was there helping me get things set up for my next round of training. This time around I had a better handle for things and didn’t need as much help, but he was still there fielding phone calls and getting back with me in fairly short notice. Overall, it was a pleasant experience yet again training with AFIT. I have been working on my instrument rating on and off for 5 years. Every time I would get motivated the distractions of life got in the way and I would get sidetracked. I decided to try something different, an accelerated training program. I contacted many of them and felt like Tony at AFIT was my best match. He allowed me to use my plane and he gave me many choices regarding locations and instructors. 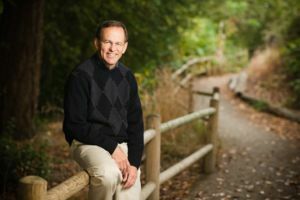 I was paired with John in the Denver area which turned out to be a perfect match for me. John is a great instructor and a wonderful person. He not only got me trained for the check ride but he taught me countless tips on how to be a better pilot. His knowledge and ability to explain was excellent. These guys have everything set up for your success as long as you put in the work. It is not an easy process. It was hard work and sometimes tiring and stressful but I know for me it’s the only way I could have gotten it done. Thank you John and Tony for helping me get the rating and become a better pilot!!! I want to commend John on his superior training capabilities. He has the respect of the DPE as well, which is utterly important in this process. My experience with John was second to none. I was convinced that my flying skills were to par for test purposes until arriving in Utah for my week of immersion training. John instilled the skills and technique that I needed to accomplish any landings, at any given wind angle and speed. He is a polished provider of aviation training. I was able to overcome any hurdle that came at me during my check ride as a result of John diligent preparation. It was a joy to learn from the best! Good afternoon Tony. I wanted to convey to you how impressed I was at the knowledge and professionalism of my instructor Mike at Lincoln, California. I wouldn’t have been able to pass my check ride without his cool and calm instruction. For those that care, I am a combat veteran of Afghanistan. I know, we’re a dime a dozen now. But I was in a few gun fights that were never as intense as flying. The first week I was drenched in sweat I was so nervous. But gradually, day by day Mike taught me how to fly good ‘ole Cessna 80246. I knew I was getting better and more confident the dryer I was when I got out of the plane! Ha! This was a long road getting this private pilot license and I was a bit skeptical about doing it in two weeks. It was a perfect block of time. I would highly recommend this course if you’re on the fence about it. Having that knowledge test passed before you show up will allow you to concentrate on flying the dang plane. The days will be LONG and the last thing you will want to do is go back to your lodging and read. I mean that wholeheartedly. So please for your own good read and study BEFORE showing up. I can’t say enough about how much fun it was. It was quite enjoyable and I look forward to doing my instrument training with AFIT as well. Thanks again Tony for your understanding and flexibility of my schedule. Thank you both so much for helping me in a difficult position; because of AFIT I am now able to apply for the Reserves Pilot Board which meets at the end of the month. I had a great time with the AFIT program. I was in a tough situation when I was forced to finish a PPL as a requirement for a program. All the flight schools in my area were booked and I was laughed at when I mentioned it needed to be done by the end of the next month. I was ridiculed and told by all 6 flight schools it would take at least 2 months to complete ground school alone. Fast forward to the AFIT program; Tony was able to schedule me in very quickly and I was in Sacramento the next day from Seattle. I was blown away by the professionalism and ease of instruction by Andy. Andy is a phenomenal instructor with a lot of patience and has a hands off approach to teaching which allowed me to learn from my mistakes quickly. 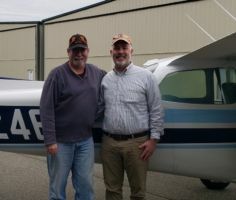 I came in with 11 flying hours but no ground instruction, and the King’s online course provided by Tony helped me pass the knowledge test and prepare well for the checkride in under a week. 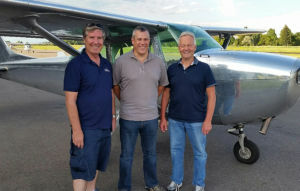 Although the course was accelerated, I was not overwhelmed with the flight lessons and the curriculum created by Andy and Tony makes it easy for anyone to succeed. Andy’s extensive flying experience means he gives tons of practical advice and can explain seemingly difficult concepts with ease. In the end, I was able to complete my checkride and have my Private Pilot Certificate in no time! Thank you AFIT for making this possible! Massive thanks to John my CFI and Tony for arranging training in the U.S to pass my 2 week accelerated PPL Course. Although challenging the training was great and had an amazing time flying all over Southern California. Would recommend the AFIT accelerated course to anyone who has a lifelong goal to be one of the few with a PPL. I look forward to coming back next year to add an instrument rating to my licence. Overall, my experience with Greg and AFIT was very positive. Greg put in a ton of effort to provide thorough and professional training. We spent many long hours prepping for the oral portion of the check-ride and the practical portion of the check-ride. I was pretty worn out at the end of every day, and that’s what I was wanting. When Greg had some personal issues come up, he made arrangements with Mike Poteet to come in and assist with my training. Greg and Mike were very knowledgeable and presented information in a professional and easy to follow manner. Both went the extra mile to make sure I was prepared for my check-ride. I would definitely recommend Greg and Mike as instructors. 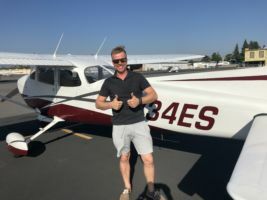 Obtaining my pilot’s license has always been a lifelong dream, however, life events have always seemed to get in the way of this goal. I’ve had some flight training prior to taking the AFIT course but the skills erosion associated with being a weekend warrior, at the mercy of inclement weather, prevented me from seeing the light at the end of the tunnel. I’m a banker in New York City with a hectic and dynamic schedule. The AFIT course made obtaining my pilot’s license a safe reality in a compressed timeframe and is specifically designed for people who are self-disciplined, driven, committed, and willing to do the pre-work required to hit the ground running. I opted to take two weeks off of work, disconnect myself from everyday life, and park myself in a rural California town where I could focus on the goal at hand. I was paired with an outstanding flight instructor who was dedicated to me and only me, day in, day out; he also ensured safety was the primary goal, not successful completion of the course. 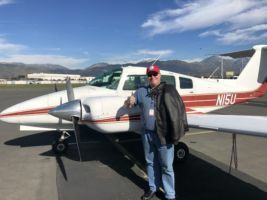 The way the AFIT course itself was laid out gave me a well-articulated roadmap to follow as I progressed through my lessons and FAA requirements. 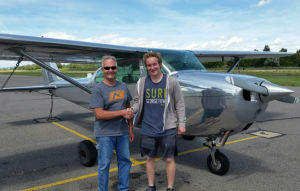 I felt comfortable at every stage – my first solo, my first cross-country, my FAA oral and check ride – and am now a Private Pilot, thanks to AFIT. Flight instructors are, in essence, teachers. 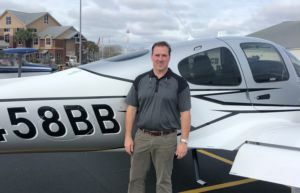 Not all teachers are created equal and the same is certainly true about flight instructors. I’ve had a few flight instructors in the past but none as committed, knowledgeable, and patient as Andy. Flying involves a lot of science – physics, statics, dynamics – but Andy’s teaching techniques are an art. He has a unique and effective way of articulating complex subject matter, often times through easy-to-understand real-life examples. I ask a lot of questions and Andy was as patient in the cockpit as he was on the ground; he took the time to explain things in depth which greatly improved my overall flying and learning curve. Andy does things by the book, as all pilots should, and during every step of my lessons with him, safety was the top priority. Flight instructors have a lasting impact on the future flying habits of their students. I certainly lucked out with Andy – he is a class act and I will undoubtedly be visiting him again for my instrument and commercial ratings. Highly recommended! I highly recommend this course to anyone who fits the personal attributes mentioned above. I cannot speak highly enough about Tony, my flight instructor Andy, and the AFIT course. 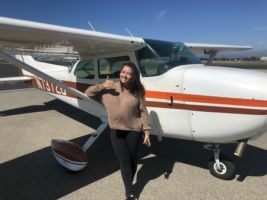 I had a terrific experience learning to fly with AFIT! Tony was very helpful insuring a smooth process. My instructor, John Mowatt, was top notch and made the training enjoyable from takeoff to landing. 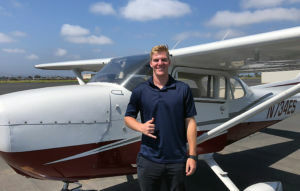 I would recommend AFIT and John to anyone looking to fulfill their dream of becoming a pilot. I sure did! Please let me send enormous ‘Thanks’ to you and my PPL instructor, Tom. 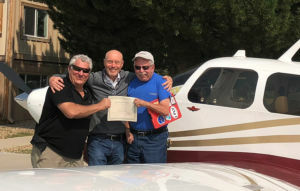 After years of working toward my private pilot’s license (and having invested thousands of dollars in another ‘finish up’ group who could not deliver what they promised), you both helped me to earn my certificate in November. 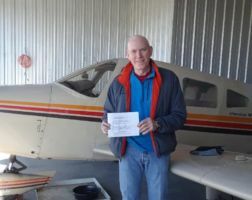 What a tremendous feeling of accomplishment, that is directly related to Tom’s incredible knowledge as a pilot and skills as an instructor. Tom has ”nerves of steel and calmness of a saint.” Hour after hour in the air or on the ground, he would (without ever raising his voice) continue to reinforce good habits and correct bad ones. He was intensely dedicated to getting my training done, too. Tom was extremely friendly to get to know, as well. He is a remarkable man and I’m so fortunate to have met and learned from him. I can’t thank you both, enough — for helping me to achieve this life-long goal! John has the ability of making the unique challenges and pressures of learning to fly seem fun and doable. 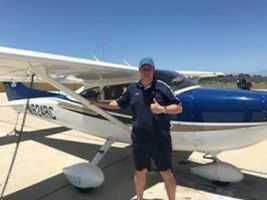 His positive attitude and approach combined with his impressive logbook really do make him a highly sought after instructor. I really enjoyed my time with him and am glad we got to work together. My experience at AFIT was an unforgettable one. Working with John has been such an honor; he was very helpful in every way even when I had some doubts when things got overwhelming. 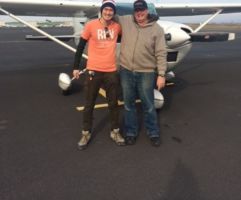 I learned a lot in such a short amount of time, and I would have never imagined that I would be able to do my first solo after one week and my first cross-country solo shortly after. This is the biggest milestone in my life and many more to come as I will continue flying in the future. I always knew that I wanted to be a pilot and it became surreal after my first solo. I had a lot of encouragement from John. This absolutely motivated me to keep pursuing my dream. I had an incredible time working with and learning from John. I am very looking forward to coming back and do some more flying with John. Just wanted to let you know how incredible this program was for me! Shawn was an absolute joy to fly with and was incredibly educational. He went above and beyond to make sure that I was the safest IFR pilot I could be. He went out of his way to find actual IMC for me to fly in and I ended up with over 8 hours of actual time. There was not a single procedure I was worried about on the check ride as Shawn was so thorough. My examiner cancelled on me last second and Shawn ended up calling many different examiners around the area to get me scheduled just a day later than expected! I was 100% confident throughout the entire process. 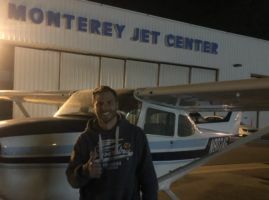 I made my flight home on a filed IFR flight plan and flew an approach in actual IMC at night and felt absolutely confident in myself as Shawn was such an incredible instructor! I would absolutely recommend this program to anybody wanting an instrument rating and I have nothing but praise for Shawn Robinson as an instructor. I just wanted to reach out and say thank you for the great experience with my 10-day AFIT instrument course! After completing the course and passing my check ride, I can’t imagine any more efficient and thorough way of obtaining an instrument rating. It was a lot of work and study, and I give so much credit to my instructor, John. He was not only experienced and knowledgeable, but he has a real talent for teaching. He was able to quickly identify my learning style, and adapt his teaching style to match it. On top of all that, John is just a great person that is enjoyable to be around – that makes a huge difference! There is a reason he has that gold seal! It sounds cliche, but I can’t say enough good things about him. Kudos to AFIT for building a team of such strong instructors. My training went very well. It was truly a pleasure to work with John and, I am very happy with the service your organization provided. Thank you so much for the wonderful training. 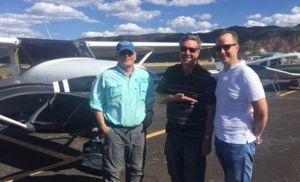 When I was first told that it was possible to go from zero to a Private Pilot in just 14 days, I was flabbergasted. But after I received my training from John, I realized it was possible. My experience of AFIT was phenomenal. The quality of your instruction, your dedication to me, and the efficiency of the whole program was excellent. For those who are willing to spend two concentrated weeks focusing only on flying, I believe that AFIT is by far the best route to take. The consistently beautiful weather in California, together with the convenience of the airport, and the quality of instruction make the amount of learning possible in those two weeks endless. My instruction from John was top-notch. I made a good friend, and learning from such a great pilot who was genuinely involved in my progress was a fantastic experience. My overall experience with AFIT was outstanding. Thank you John for your dedication and sincerity. I look forward to being back for my instrument rating. I just wanted to say thank you and that the accelerated course was just what I needed to be able to successfully knock out my license. Ruben was a blast to fly with and taught me a lot. The other instructors that I met along the way were very nice as well. My time with AFIT was definitely worth it. A colleague recommended AFIT to me and I’m glad he did. Greg and Michael at AFIT taught me how to fly! I trained with them to get my Private Pilot Certificate and will be coming back to them for my Instrument Rating. They’re more knowledgeable than other CFIs. And that matters because they make the FAA regulations make sense. They don’t just know the answers. They also know the best way to teach the material. AFIT is a professional school with a syllabus that they stick to – look for that before you consider another school. The syllabus keeps them focused on fundamentals, not distracting details. And their helpful mnemonics (GUMPS, CTAF, PAVE, DECIDE, CFIT) will forever be drilled in your head, to keep you safe, and help you pass your check ride. I’ve had a lot of fun training and great experiences flying! I recommend AFIT to anyone. 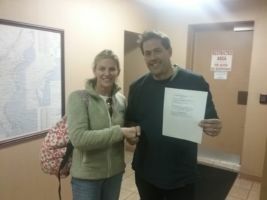 I want to thank you, and specifically AFIT instructor Andy, for my fantastic experience in obtaining my IFR. After obtaining my private pilot’s license four years ago, I have flown general aviation aircraft for pleasure almost exclusively in the Pacific Northwest, where IMC and 2000 foot ceilings are commonplace throughout the year. 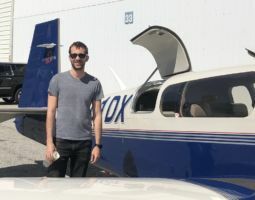 In pursuing my instrument rating locally, I tried to block out a couple hours a week from my professional career and focus on an IFR training syllabus. It was an almost impossible task, and so I turned to AFIT to complete my course. 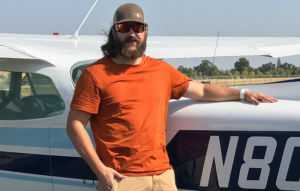 To become proficient flying in IMC conditions, I needed to remove myself from my daily routine of career and family and focus exclusively on this goal, and so decided to complete this journey by enrolling in your accelerated course at Lincoln, CA. Your instrument program turned out to be the perfect solution. Within an hour, instructor Andy had me flying under the hood to assess my flying ability, and what we needed to focus on to reach my goals. I had already passed the written exam, allowing us more time in the air. For the next eight days Andy had me flying departures, holds, procedure turns, and every approach in the book. We did this morning after morning, day after day, for eight straight days. Our lunch breaks were spent reviewing the procedures, analyzing deficiencies, and discussing different scenarios. Afternoons were spent with either more flying, or more discussion in preparation of the oral exam as Andy shared his wisdom of accumulated knowledge built on an impressive career in aviation. In reflecting on my experience with AFIT, I especially appreciate Andy’s intuitive ability to decipher where I was at in my IFR training. He realized that while my immediate goal was to pass the final exam, his goal was to make me a more accomplished and safer IFR pilot. The ten days spent with AFIT instructor Andy has been a highlight of my aviation career. Thanks to both of you for your role in making my dream come true. I wanted to thank you for setting me up with John for my multi-engine add-on to my commercial license. He was very talented as an instructor, and I learned a lot while flying with him. 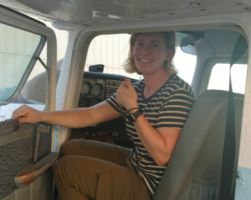 I felt well prepared, and I was very confident in the airplane for my check ride. I also appreciated John’s sense of humor and his enthusiasm. It was a tremendous experience and I credit John with making it such. I’ve never smiled as big in an airplane before! I’m headed back to Seattle and wanted to give you a review of my experience with this program. Instruction: The knowledge acquired and Greg’s instruction were incomparable. He’s the best, most experienced instructor I’ve ever worked with: kind, patient, thoughtful, knowledgeable, humble, and a superlative teacher. He has a way of making complex concepts simple and encourages critical thinking–why we’re doing something, not just how. Anyone who works with him will learn a ridiculous amount in a short time. Every instructor I met at Lincoln who worked with AFIT was similarly incredible. Poteet, Andy, Sean all welcomed me, made me coffee, bought me lunch, and took time to chat with me and offer fantastic advice. 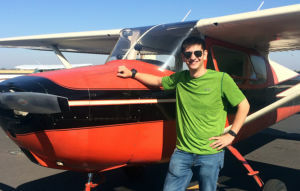 Airport: In my opinion, the Sacramento valley is unparalleled for student pilots. So many useful landmarks, stunning mountain strips, great WWII history, 10,000′ runways, fields you could land in if you needed to, the Buttes and Folsom Lake for easy orientation…heaven. Lincoln has to be one of my favorite airports of all time; long paved strip, uncontrolled, no big obstacles at either end, favorable winds. Thanks for the opportunity to work with Greg. You were very responsive and originally took me on last-minute and I appreciated that. This was an edifying experience and I learned a lot. I wanted to reach out to you and thank you for the assistance with finishing my flight training. 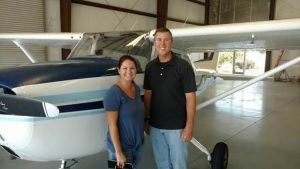 Shawn was fantastic in his teaching ability and diverse flight experience. Willing to do whatever it took to help me pass my Check ride. Shawn really made the process seem easy. I’m looking forward to doing my instrument training with him in the future. I would recommend AFIT to anyone considering getting their pilots license. Good Morning Tony…it’s Saturday, and I am finally getting a little quiet time to reflect on my recent experience with AFIT & Ruben, culminating in those three amazing words from the mouth of the DPE sitting 2 inches to my right…”Congratulations, you passed!” That happened on Tuesday morning, I flew back to my home town near Houston, TX from Sacramento, CA, and just now the wave of satisfaction and joy is finally catching up to me. The 10-Day Finisher Course was exactly what I needed. 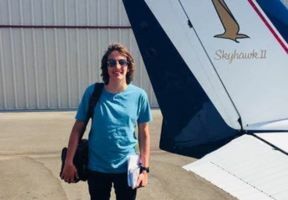 After beginning my journey summer of 2016, soloing that December, I was struggling to cross the finish line between my work/life schedule, as well as increasingly squeezed CFI’s at my flight school. Finally, in December 2018 (2 years after solo), I was ready to go full throttle. I knew accelerated programs were out there, but I also knew there was a continuum on the quality of that training. Since my dream is to fly my family of 5 around the country, quality wasn’t something I was willing to skimp on. After some time researching the internet, talking to several folks, Tony and AFIT began to float to the top. I had roughly 55 hrs of flight time & training, including a solo endorsement when Ruben met me at the Lincoln, CA pilots lounge. 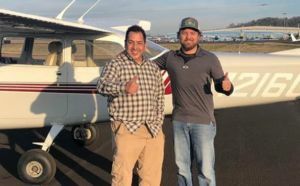 I knew I could take off, land, and likely navigate, somewhat safely, across the unfamiliar Sacramento Valley area, but that wasn’t anywhere close to the goal for both Ruben & myself. Currency & Proficiency ARE NOT the same! 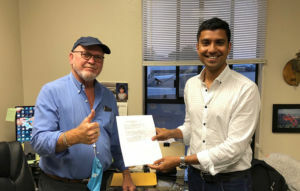 Ruben worked tirelessly and patiently with me to not only complete my flight requirements, prepare for the check ride, but even more…to make me a safe and competent “real world” pilot. I am proud to hold my certificate in my hand. I know this marks the beginning of a whole new chapter for me and my family. And I feel incredibly blessed to have found Tony, Ruben and AFIT! 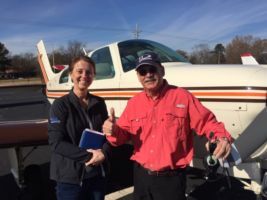 If you are tired of bumbling to the finish line, and you can afford to take time to focus exclusively on the miracle and responsibility of general aviation…AFIT is a wonderful partner!! Thanks Ruben & Tony…you will forever be a part of my aviation story! 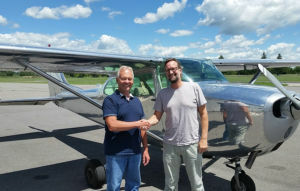 I trained with Mike for single-engine IFR. Not only was he an excellent instructor and aviation mentor to me, but he was a wonderful human being, as well. 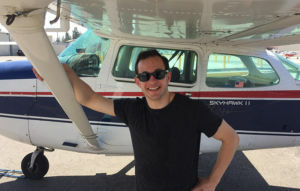 Mike was a calming presence, understanding, helpful, and flexible .He had a great sense of humor throughout, was observant about my strengths and weaknesses as a pilot, candid but gentle about what I needed to work on. He made sure I would pass my check ride, but more importantly, truly cared about making me a safe and wise pilot in single-pilot IFR, with room to keep growing and learning for years to come. I felt like he was always there for me. To Mike, thank you again for the care and attention you showed me during my time training with you — I really don’t know how to thank you enough. I had a great time flying and training with Shawn over the last 10 days. He’s an excellent teacher, and he gave me the knowledge and experience needed to feel confident filing and flying in the IFR system. In addition to practicing lots of approaches in both simulated and actual IMC, we flew real cross-country point-to-point trips which helped me see how everything fits together. By the end of the training, I was more than prepared to pass the check ride. And it felt great to fly home solo afterward on an IFR flight plan without hesitation. I highly recommend AFIT and Shawn to anyone serious about training. I just wanted to spend a moment telling you how happy I am that I chose AFIT for my IFR training. The program was intense but well worth the time. I can’t imagine how long (or how much more money) it would have taken me to get my IFR rating if I had done it the same way I did my private. There really is no substitute for hands on experience in the airplane you’re going to be flying in. I also wanted to let you know that John was a pleasure to fly with. He has the patience of Job and a great teaching style that made me feel confident throughout the process. I would highly recommend anyone wanting to get there IFR rating to come talk to you, especially if they have a busy schedule. When I arrived VFR from Texas and began decent into the Oxnard (KXOR)area for my IFR training, I was vectored south of the Camarillo (KCMA) airport and then mistakenly lined up on what I thought was the Oxnard airport to the west…… well, it turns out it was the Point Magu Naval Air Station (KNTD) I was lined up on and quickly instructed to expedite a 180 degree turn and head toward the Financial Plaza to enter the pattern for Oxnard. When I met my instructor John the next morning I told him this story and that I thought we had a lot of work to do, and we did. 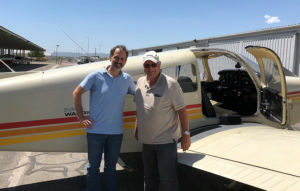 Slowly but surely, John tested and refined my flying and navigation skills to a point where I could began to integrate the concepts of instrument flying with he systems in my Bonanza. We flew every morning and every afternoon shooting approaches in some very busy airspace followed by a through debrief of weaknesses and strengths (which usually led to homework). Fast forward to my return trip back home to Texas (with my instrument rating) with my wife onboard, I descended confidently through 4,500 ft of clouds and broke out 900 ft above the ground lined up perfectly on the RNAV 15 approach Into T82. Nailed it. While I have a lot yet to learn about instrument flying, the attention and challenge I received during the training was priceless. 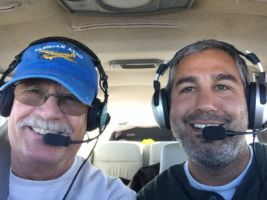 When we weren’t flying, my instructor John was peppering me with questions to prepare me for the oral, which helped me focus on the areas where I was weak. The oral went great. To close, I feel the intensity, repetition, and frequency provided by this training provided me a solid base to build from and along the way I developed a friendship that will last forever; John and I hold a similar passion for flying and I’m sure we’ll fly together again. I entered your program with 1.3 hours of demo-ride flight time and exited 2 weeks later as a private pilot, despite many weather challenges! IMO the accelerated approach is the best way to get a license –from cost, time efficiency, and learning perspectives. Immersive daily flying and instruction was invaluable. The best part of the experience was my instructor, Greg. I can’t say enough positive things about him, but I’ll try. He obviously loves aviation and perhaps, more importantly, teaching. He isn’t in it to build hours but to create competent pilots, e.g. he also supports and teaches aviation at local high schools and colleges. 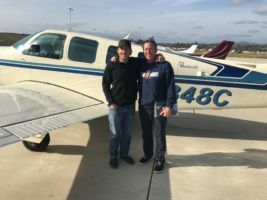 While I purposely sought out an experienced CFI with a lot of time in the saddle (as compared to younger CFIs trying to build time), I hadn’t given much thought to Greg’s military pilot experience, which turned out to be extremely beneficial, especially to me. He brought a level of discipline and process which were exactly the foundation I needed to build good habits. Greg had plenty of real-world anecdotes from personal experience that helped me focus on the most important priorities in the cockpit. And while the weather made for many early morning and late afternoon flights, Greg committed the time to see it through. As a result, we spent a lot of time together, and I still liked him in the end! Two other things that were beneficial. One was just hanging around the hanger with your other CFI’s. Mike and Ruben were always ready to answer questions and provide advice and moreover helped moving aircraft around/ordering fuel/etc. — they went above and beyond. Second, my check ride had to get rescheduled because of weather-related training delays. I don’t think this would have been accommodated without Greg’s / AFIT’s relationship with the DPE, as they are very busy and tightly scheduled. Lastly, I can’t understate the value of having a dedicated aeroplane provider and partner. They worked hard to ensure a suitable plane was available for training. 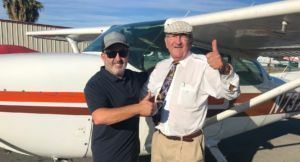 I’d looked at a number of different traditional local options – 1 CFI/1 plane, to flight schools (scheduling hell) – and having a dedicated instructor with a pool of aeroplanes is the best way to go.